The most burdensome and annoying of the special taxes imposed upon the Jews of Russia by the government. The edict concerning this medieval tax—one of the legacies inherited by the Russian government from the Catholic monasteries—was issued Dec. 31, 1844. The tax is divided into a general tax and an auxiliary one. The general tax is raised from the kosher meat used by the Jews, which is, therefore, little accessible to the Jewish masses; and the tax has consequently been inimical to the physical development of the Russian Jews. This tax is levied (1) on every head of cattle killed for kosher meat; (2) on every fowl killed for the same purpose; and (3) on every pound of meat sold in the market. The auxiliary tax is derived from various trade licenses, and, as a kind of probate duty, from money inherited by Jews. To the Basket-Tax also belongs the tax on old-fashioned wearing apparel, such as the old Polish caftan, the skull-cap, and women's head-gear and perukes. 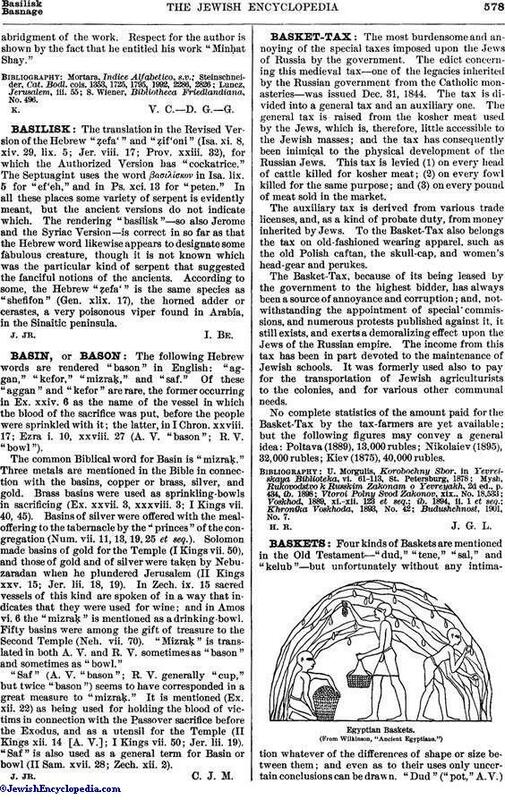 The Basket-Tax, because of its being leased by the government to the highest bidder, has always been a source of annoyance and corruption; and, notwithstanding the appointment of special commissions, and numerous protests published against it, it still exists, and exerts a demoralizing effect upon the Jews of the Russian empire. The income from this tax has been in part devoted to the maintenance of Jewish schools. It was formerly used also to pay for the transportation of Jewish agriculturists to the colonies, and for various other communal needs. No complete statistics of the amount paid for the Basket-Tax by the tax-farmers are yet available; but the following figures may convey a general idea: Poltava (1889), 13,000 rubles; Nikolaiev (1895), 32,000 rubles; Kiev (1875), 40,000 rubles.